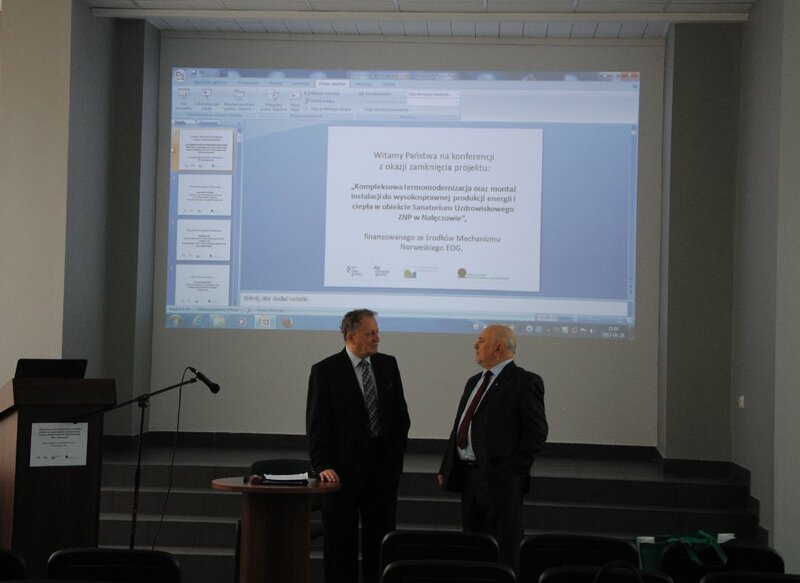 On 28th April 2017 in the conference room of the Health Resort of the Polish Teachers’ Union (ZNP) in Nałęczów a conference was held ending officially the project entitled “Comprehensive thermo-modernisation and installation of high-efficiency co-generation system of electric energy in the facility - the Health Resort of the Polish Teachers’ Union in Nałęczów”, which was started in 2015. 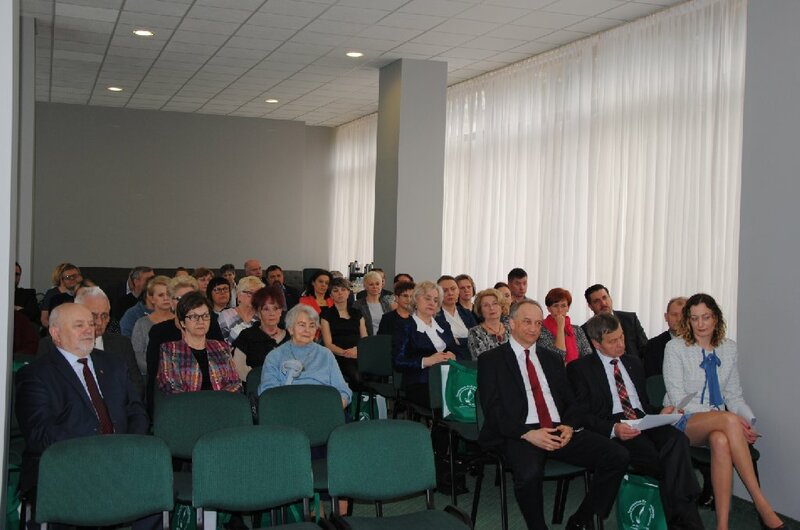 During the conference, which was attended by a significant number of the local residents, the Director of the Health Resort, Anna Lewandowska summed up the executed investment project and presented general objectives and assumptions of the project. 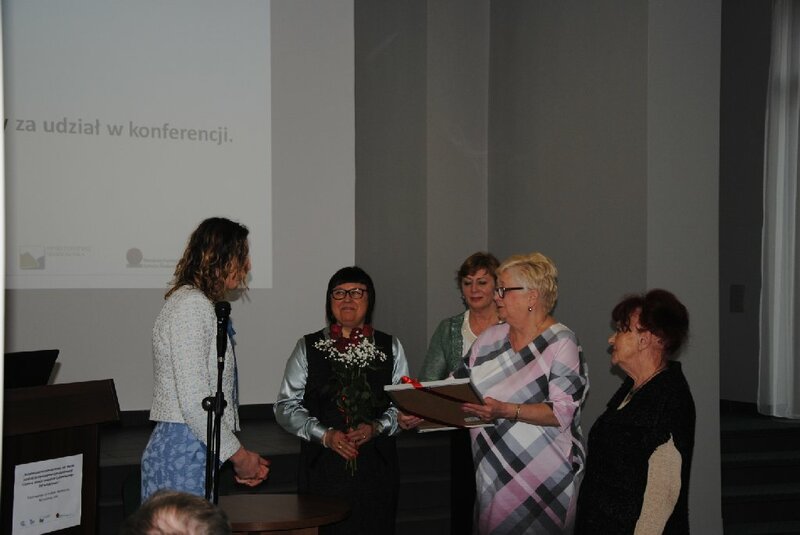 In order to execute the task the co-financing from the funds of Financial Mechanism of the European Economic Area 2009-2014/ of the Norwegian Financial Mechanism 2009-2014 was obtained under the Programme PL04 “Energy saving and promoting renewable energy sources”. The Operator of the Programme was the Ministry of the Environment along with the National Fund for Environmental Protection and Water Management. 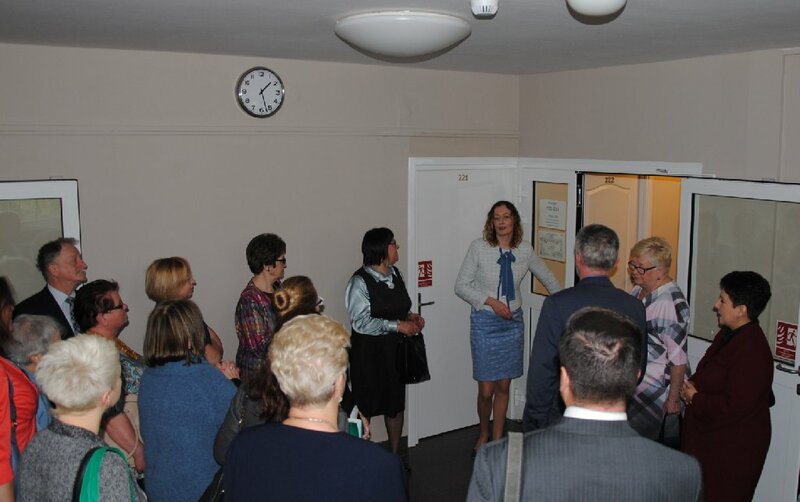 The need for the execution of the investment project resulted from the energy audit carried out in the building of the Health Resort of the Polish Teachers’ Union in Nałęczów and from the need to lower the running costs of the Health Resort building. 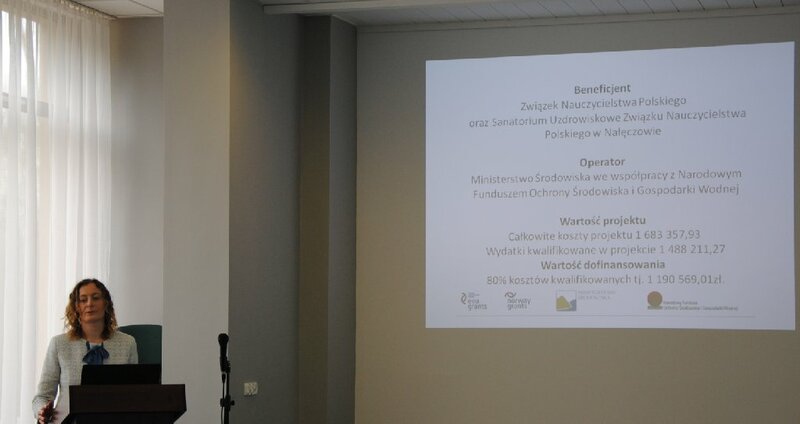 The main objectives of the investment project included the improvement of energy performance in the Health Resort building of the Polish Teachers’ Union in Nałęczów, generation of energy from renewable energy sources and improvement of air quality in Nałęczów health resort municipality. The completed investment project will add to lowering of the CO2 emission by 344.85 Mg per year . The capacity to generate energy from renewable sources will be 348.86 MWh per year..
- installation of 1000 l buffer tanks for heating water - 2 pcs. 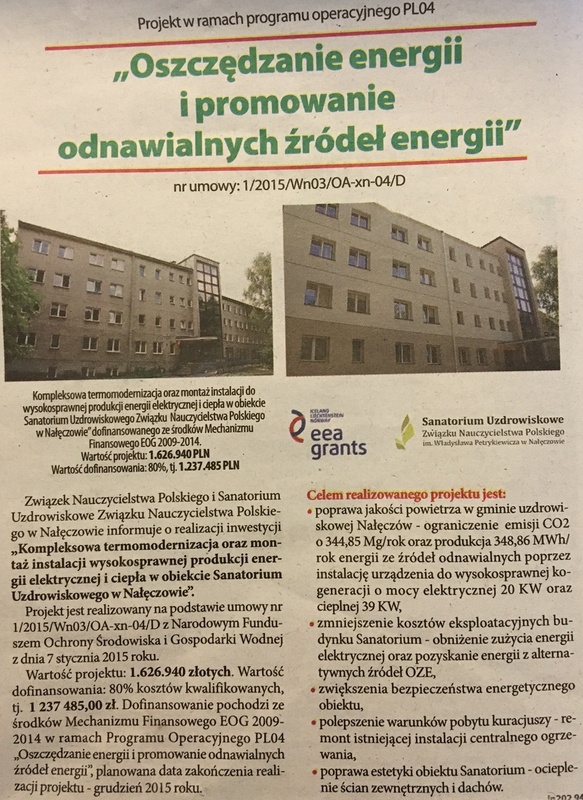 On 28th April 2017 an article was published in the local daily “Kurier Lubelski” informing about the completion of works conducted under the project “Comprehensive thermo-modernisation and installation of high-efficiency co-generation system of electric energy in the facility - the Health Resort of the Polish Teachers’ Union in Nałęczów” under the Operational Programme PL04 “Energy saving and promoting renewable energy sources”. On 27th April the final acceptance of works related to the modernisation of the heating system took place. On 23 December the final acceptance of works related to thermal modernisation of the building was carried out. Waiting for connection of the cogeneration module. Carrying out thermal insulation of all walls, foundations, roofs and flat roofs, completion of roof works, rain gutters, concrete sett paving trim round the building, execution of the new lighting protection system. Execution of all new vertical heating pipework, all heaters as provided by the project were installed (351 pcs), installation works in the boiler house were completed, one gas heating boiler was removed, leakage test of the new heating system was performed, following the positive test result it was commissioned for the winter season. 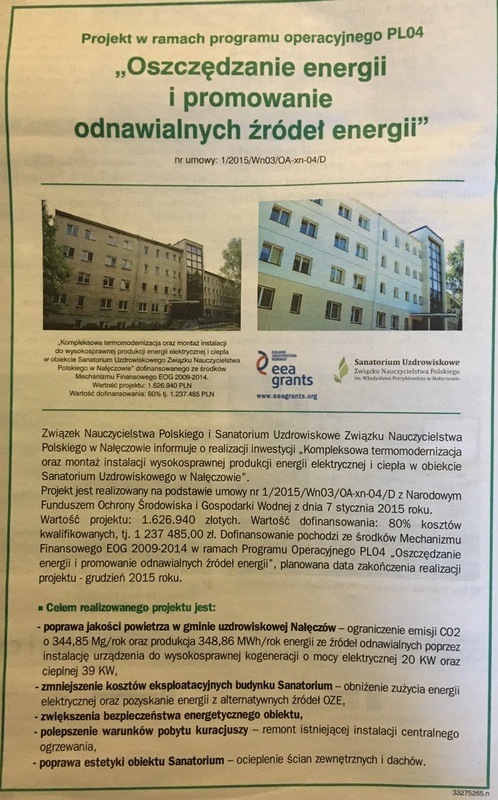 On 23rd , 26 th , 27 th and 30th November 2015 in the local press "Kurier Lubelski", "Gazeta Wyborcza" and "Dziennik Wschodni" was published the information about the main objectives of the investment: “Complex thermal efficiency improvement and the application of the installation is a guarantee of the high- performance production of the electricity and the heat in the building of Sanatorium Uzdrowiskowe ZNP w Nałęczowie [health resort of Polish Teacher’s Union] in Nałęczów within the Operational Programme PL04 “Saving energy and promoting renewable energy source”. In connection with closing for guests the Sanatorium building on 23 September, thermal insulation works can be moved to the southern façade where there are hotel rooms. Therefore, the works on balconies and terrace will start and they will be connected with the replacement of flashing, tiles, lighting protection system and thermal insulation of walls, plinths and foundations. All old heaters – 283 pcs in total – were already removed; moreover all horizontal and vertical pipework was removed in the basement as well as the pipework in the residential facilities and treatment facilities. In progress are the works related to the assembly of new heaters and vertical and horizontal pipework of the central heating system in the rooms and bathrooms. Thermal insulation works on the northern façade of the building are in progress. Due to favourable atmospheric conditions, the contractor is slightly ahead of the schedule. Currently executed works include demolition works on the façade, earthworks at the foundations, damp insulation, thermal insulation with expanded polystyrene and mineral wool of cellar walls, plinths and building walls; the new lighting protection system is being executed as well as rain gutters and drain pipework; total thermal insulation of the flat roof with granulate material was carried out, new flashing is installed, roofs are covered with tar board. In progress are the works inside the building related to the new central heating installation. In the boiler house dismantling works are carried out; a cogeneration module was introduced to the building as well as heating water buffer tanks, the exhaust discharge system was installed on the façade of the building. 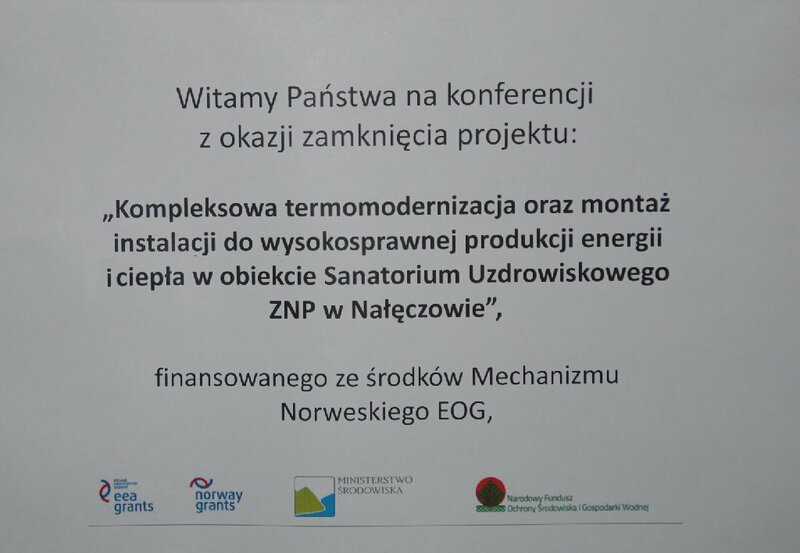 On 10 June 2015 a contract was signed for the execution of construction works “Execution of modernisation works of the heating system in the building of Sanatorium Uzdrowiskowe ZNP in Nałęczów”. The tender procedure was announced on 28 April 2015. In response to the request for bid, the quotations were submitted by 10 contractors. On 26 May 2015 the information was published on the choice of the most favourable quotation which was submitted by the company “SGW Budownictwo Waldemar Stelmach”, ul. 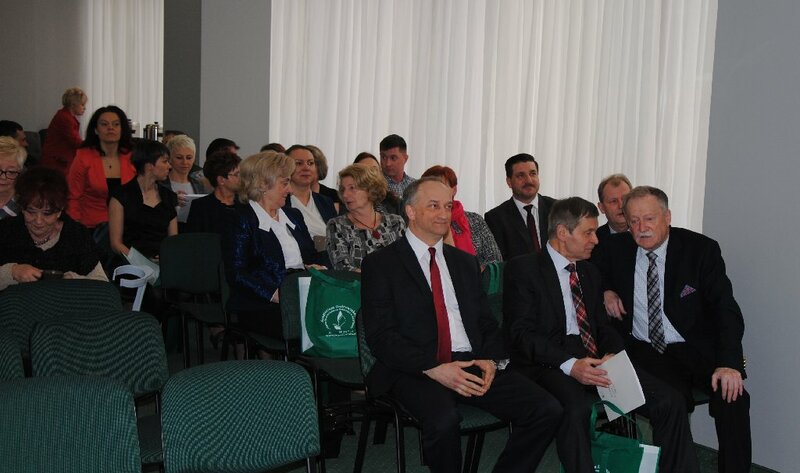 Mokra 2, 26-600 Radom. The quotation complied with all requirements and conditions as determined in SIWZ and the proposed price was the lowest out of the non-rejectable quotations. The choice criterion of the quotation was in 100% the gross price. 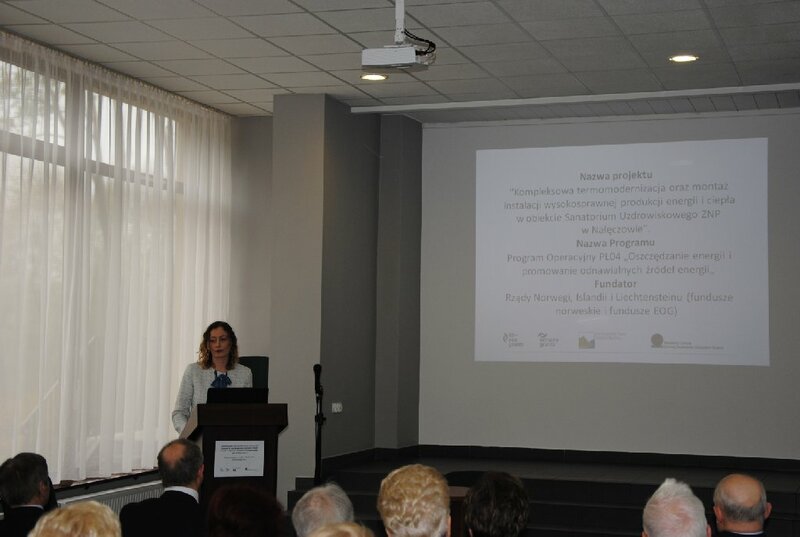 On 3 June 2015 a contract was signed for the execution of construction works “Execution of wall and roof thermal insulation in the building of Sanatorium Uzdrowiskowe ZNP in Nałęczów”. The tender procedure was announced on 23 April 2015. In response to the request for bid, the quotations were submitted by 3 contractors. 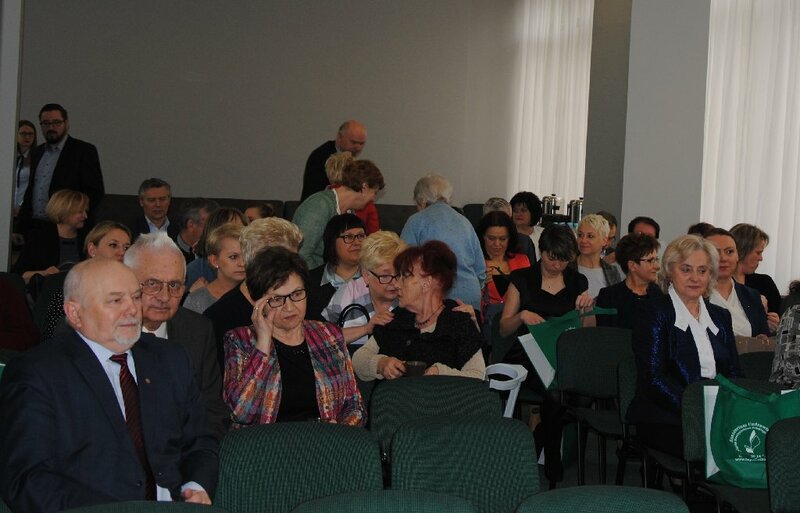 On 21 May 2015 the information was published on the choice of the most favourable quotation which was submitted by the company “Przedsiębiorstwo Handlowo Produkcyjno Usługowe – Franciszek Wach”, Plac partyzantów 1, 26-713 Kazanów. The quotation complied with all requirements and conditions as determined in SIWZ and the proposed price was the lowest out of the non-rejectable quotations. The choice criterion of the quotation was in 100% the gross price.